Apple Dropping Google Maps In iOS 6 For In-House 3D Maps App? 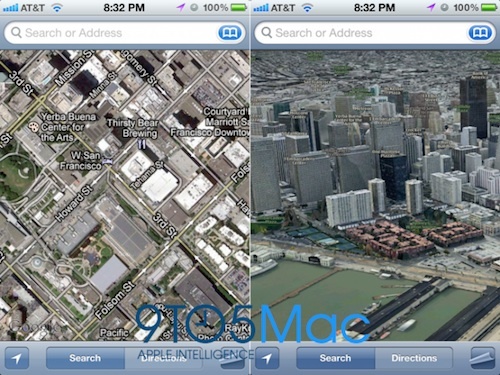 Apple will be dropping Google Maps from iOS 6 and implementing a new in-house 3D Maps app according to a report from 9to5Mac. The new maps app will run natively from the home screen and will include a powerful new 3D mode, a feature that has been rumored ever since Apple’s acquisition of 3D mapping firm C3 Technologies, and cartographic companies Placebase and Poly9. The 3D mode will not run as standard, as there are obvious practical limitations, such as perspective and city buildings that would obscure navigation routes while driving. The feature will likely be enabled in a similar way to the current satellite view, allowing users to explore cities like never before with beautiful high-resolution imagery. We’ve independently confirmed that this is indeed the case. Sources describe the new Maps app as a forthcoming tent-pole feature of iOS that will, in the words of one, “blow your head off.” I’m not quite sure what that means, and the source in question declined to elaborate, but it’s likely a reference to the photorealistic 3-D mapping tech Apple acquired when it purchased C3 Technologies. Apple will likely announce further details about the 3D mapping service at the WorldWide Developer Conference next month.